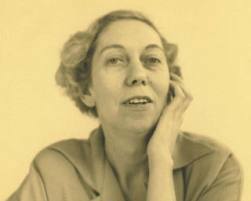 Eudora Alice Welty (1909-2001) was a Pulitzer author of international acclaim who was born, and died, in Jackson, Mississippi. Though her stories and novels were set in the south, she did not consider herself a southern writer; she traveled and lived in New York, San Francisco, Mexico, Europe; her friends included authors and artists from around the world. 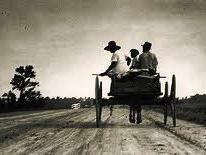 But her love of the south, and the people living there, comes through in every word she wrote; gentle perceptions overlain with a fierce wit, always ringing true. It is through place that we put down roots, wherever birth, chance, fate or our traveling selves set us down….Through travel I first became aware of the outside world. It was through travel that I found my own introspective way into becoming a part of it….The trips were wholes unto themselves. They were stories. Not only in form, but in their taking on direction, movement, development, change….When I did begin to write, the short story was a shape that had already formed itself and stood waiting in the back of my mind. 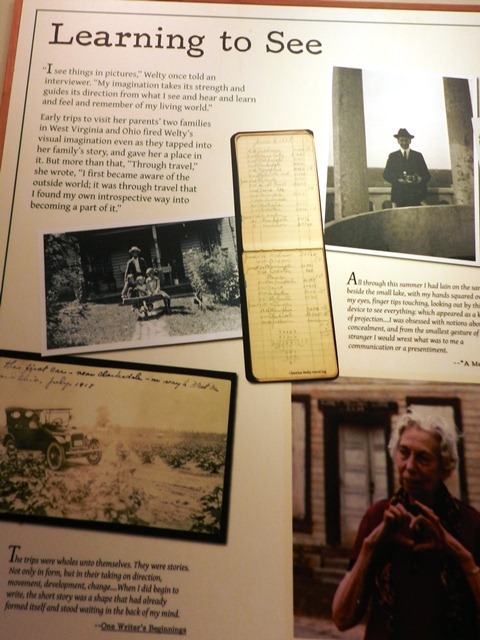 Today I immersed myself in Welty life in my two-hour visit to the Museum and to the home Eudora lived in for most of her life. I walked through the gardens where camellias and roses still bloom beneath tall southern pines. I stood in the kitchen where Eudora and her mother cooked; the house has been restored to a 1980’s look (her last active writing period) but in earlier days it had a wood stove and an ice box; they have pictures you can see. The ice box was built into the wall; the iceman delivered new blocks through an opening on the back porch. 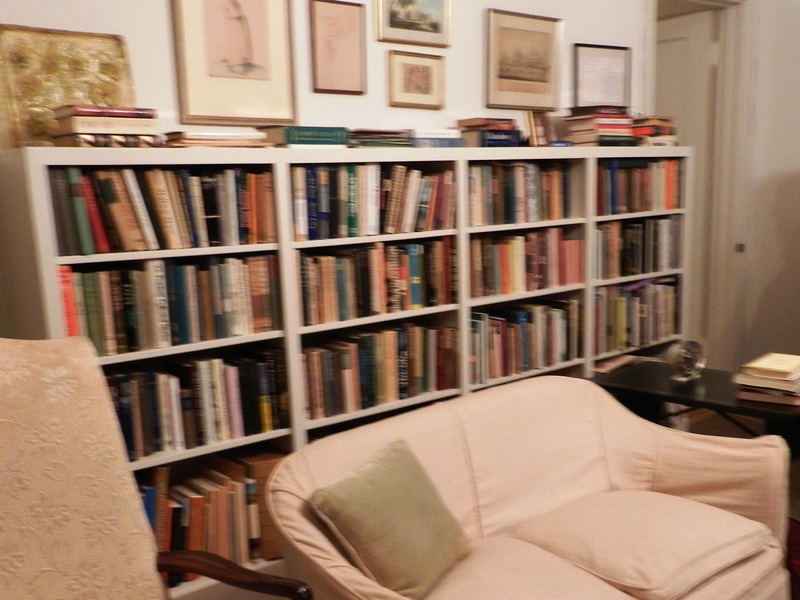 On the wall in her study hangs a hand-penned note from E M Forster (English author, 1879-1970) expressing his admiration for her and for her work. 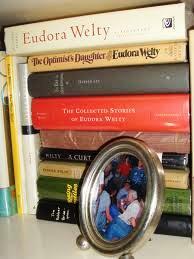 Pictures of Eudora with her mother, brothers, nieces, and friends are scattered here and there. On the table in her dining room the pages of a manuscript are spread; paragraphs cut and moved and pinned in a new position with straight pins; she never switched to computers or even an electric typewriter until right at the last; they made too much noise, she said. 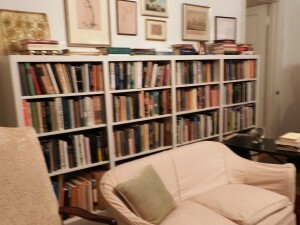 Books are everywhere; there’s a casual comfortable charm. The painting over the mantle came from a trip to Santa Fe after her mother died. She wrote The Optimist’s Daughter after that; it’s the book that earned her the Pulitzer. The house belongs to the state of Mississippi now, administered by the Mississippi Department of Archives and History. Eudora made arrangements to donate the house and her belongings to the state after she died; it is one of the nation’s most intact literary house museums; a National Historic Landmark and open to the public. 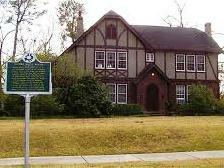 Our family house and the Music Building of Belhaven College stood directly across the street from each other. Drifting out through the open windows of the practice rooms opposite and, floating across Pinehurst Street, in through the open windows of my upstairs room where I sat at the typewriter working, came the clear, searching, repeating sounds of piano practice. I could almost hear it myself as the tour guide led me through today; the music from across the street; the typewriter keys clicking away; the pause. Footsteps on the stairs as she came down for a tomato sandwich for lunch. The sounds of one very special woman, listening. 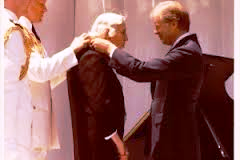 Eudora Welty received 38 honorary doctorate degrees and more than 40 major literary awards in her lifetime. She toured and lectured around the world, though refusing always to speak before any audience that was segregrated. 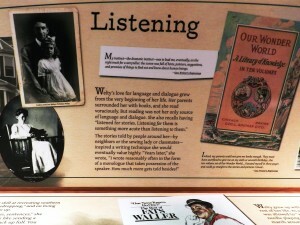 Her published works include over 40 short stories, 5 novels, 3 works of nonfiction, and one children’s book.